Alaska is known around the world for its incredible beauty, vast wilderness and as in the southeastern city of Ketchikan AK, some of the worlds best salmon fishing. This is where your unforgettable salmon fishing adventure begins with a chartered, private boat excursion guided by Anglers Adventures & Outfitters. As you arrive in Ketchikan you will probably find a quaint city that isn’t afraid to declare itself the Salmon Capital of the World. 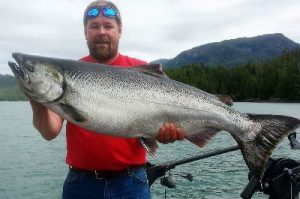 Captain Brian Ringeisen is the perfect guide to immerse you in the salmon fishing way of life, take in the jaw dropping scenery and catch your share of wild caught, delicious salmon. There is no need to worry about where the fish are biting. Captain Brian has 26 years of experience with guiding boats and fishing Alaska’s famed Inside Passage. This gorgeous network of waterways winds its way through some of the most beautiful scenery on the planet. Several varieties of salmon call this area home. Don’t be surprised if your fishing guides bring you to waters that hold Pink Salmon, Sockeye Salmon, Chinook Salmon or Coho Salmon. Enjoy the flavorful catch of the day and bring the rest home to enjoy all year. The difference between salmon that is raised in its natural environment and salmon from a fish farm or aquaculture is notable. Farmed salmon is higher in fat and contains a higher ratio of Omega 6 as compared to Omega 3 fatty acids. Wild salmon has a unique color, flavor and texture that an experienced salmon fisherman can spot right away. 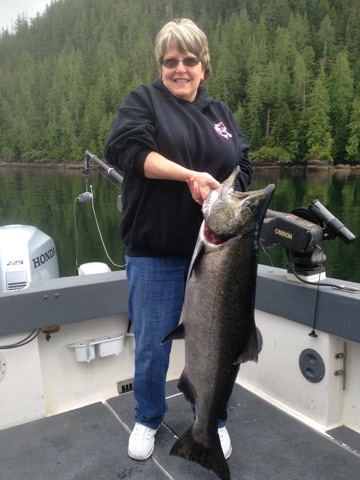 Schedule your unforgettable Ketchikan, Alaska salmon fishing expedition by calling Captian Brian at Anglers Adventures & Outfitters at (907) 254-0880 or email brian@anglers-adventures.com.